Analyzing primary sources is an important social studies skill. 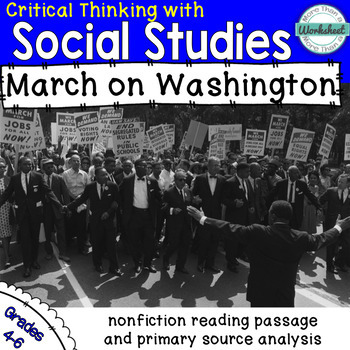 This pack gives students the opportunity to analyze a photo of The March on Washington for Jobs and Freedom and read an original informational text about the march. The passage includes details about Martin Luther King Jr.'s "I Have a Dream" speech, the Civil Rights Act of 1964, and other details about the march. 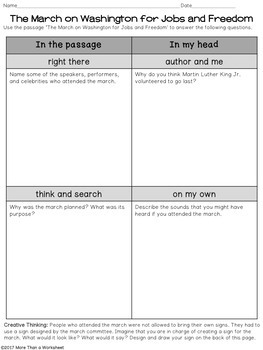 This pack is a perfect addition to a civil rights unit or a great activity for Black History Month. However you use it, your students will be thinking critically while analyzing and discussing this important event in civil rights history. 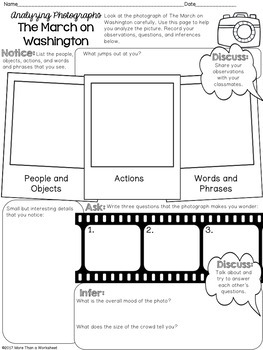 This pack includes two activities that are independent of each other and can be completed in any order. However, I prefer to analyze the photo first because it helps give students background information to better understand the reading passage. 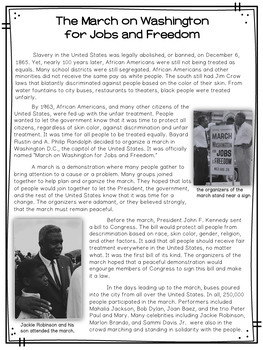 Informational Text “The March on Washington for Jobs and Freedom” Depending on your students, this could be an individual reading task or a whole class or guided reading activity. I prefer whole class or small group (as opposed to just letting students do it independently or for homework) because there are so many opportunities for good discussion. Use one or both, it’s up to you. The multiple choice questions are basic comprehension questions. The four square organizer is set up in a QAR (Question Answer Relationship) format. If you’ve never used QAR, the idea is to teach students to pay attention to the type of question being asked in order to best answer it.